Paul McCartney in ‘Mull of Kintyre’, a Dolby Atmos VR experience in the Jaunt VR app. Virtual reality specialist Jaunt and Dolby Laboratories have launched a section on the Jaunt VR app dedicated to content mixed in Dolby Atmos sound. The branded Dolby Atmos portal is designed to give viewers easy access to all available Dolby Atmos-enabled VR experiences and is available on the Jaunt VR app for iOS, Android, Samsung Gear VR, Oculus Rift, or HTC Vive. “Over the past twelve months, we’ve been working closely with Dolby and leading filmmakers, musicians and brands to create a library of marquee titles leveraging the Dolby Atmos technology,” said Cliff Plumer, president of Jaunt Studios. 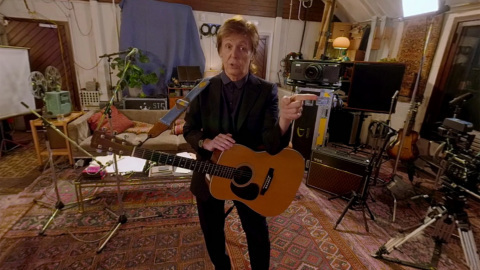 As part of the launch, Jaunt is releasing the latest episode in a multi-part documentary VR series about Pure McCartney. Other titles available in the Dolby Atmos portal at launch include Jack White: Ball & Biscuit, Revolt: Big Sean, and Rapid Fire: A Brief History of Flight. Jaunt is backed by a number of prominent investors, including Google Ventures, Highland Capital and Sky. Last September, Disney led a new US$65 million (€58 million) funding round in the cinematic VR firm, in which Sky upped its investment in the firm and ProSiebenSat.1 came on board as an investor.